People would like to choose some unique ringtones when they set their iPhone ringtones. Of course, users can directly purchase iPhone ringtones from iTunes store or other APP store. But if there are some nice customized ringtones on your computer, you may need the other easy methods to help you transfer them to your iPhone. The following guidance will show you how to sync ringtones to iPhone within simple clicks. And the following guide works with all iPhone models including iPhone 6s and all versions of iTunes, including iTunes 12. 1. Plug your iPhone into the computer with the USB cable. iTunes will launch automatically. If not, double-click the icon of iTunes to start it. 2. Click “File” on the upper left corner of iTunes, and then click “Add File to Library”. Select ringtones from computer. Or directly drag ringtones to your iTunes library. You can also click on Tones from your iTunes library and drop the ringtones there. 3. 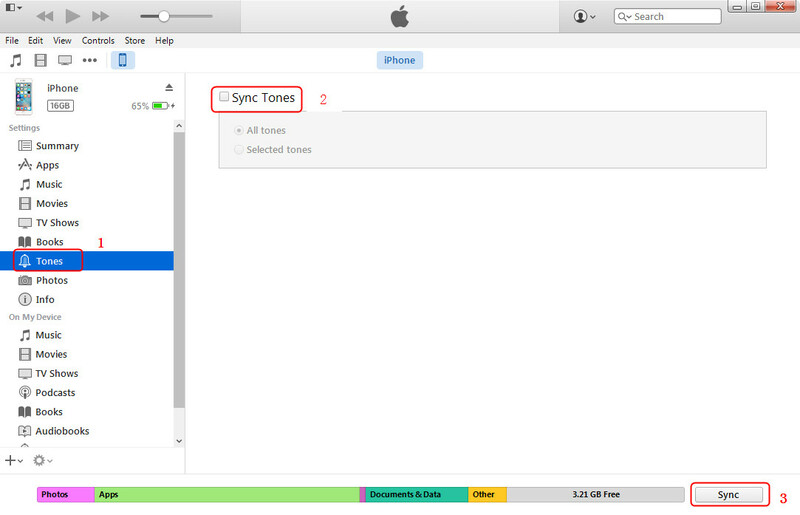 After the ringtones being synced to the library of iTunes, click Tones Library under the Settings and choose to sync all tones or selected tones. Then click Sync button to sync ringtones to iPhone. Note: when you click “Sync Tones”, there will be a pop-up window to remind you click “Remove and Sync”, which means that iTunes will sync media files together in one sync, when you sync ringtones to iPhone, you will get music synced as well. So this may lead to the loss of non-purchased music files. If you want to sync ringtones to iPhone without worries, the third-party software, Leawo iTransfer, is recommended, which can help you transfer ringtones from iTunes or computer to iPhone within three steps. 1.Run Leawo iTransfer and connect iPhone. The software will automatically detect the libraries of the iPhone, and then display the libraries in the left sidebar. 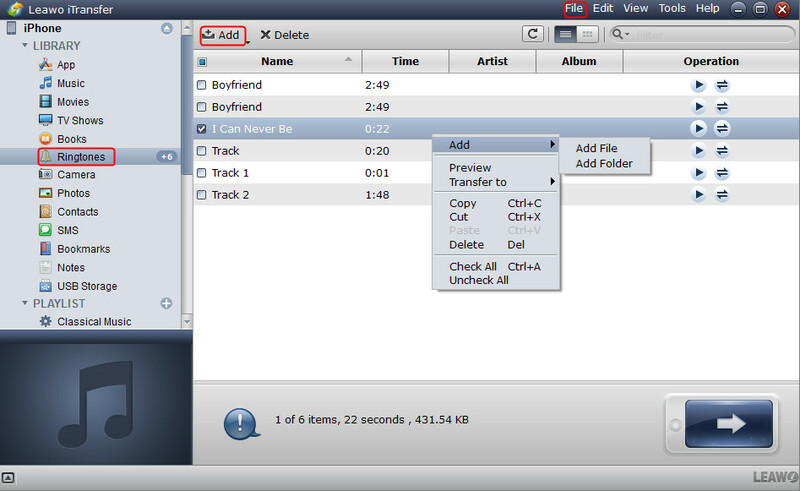 2.Choose Ringtones library and then the contents will be displayed in the right part. If no ringtones are available in your iPhone, you will see an “Add Files” button in the window, and you are allowed to select files from computer. If you have existed ringtones in iPhone, you will need to click “File > Add > Add Files/Add Folder” at the upper right corner to select ringtones from iPhone. Or click “Add” button at the upper left corner; or right-click “Ringtones” library to add ringtones from computer. 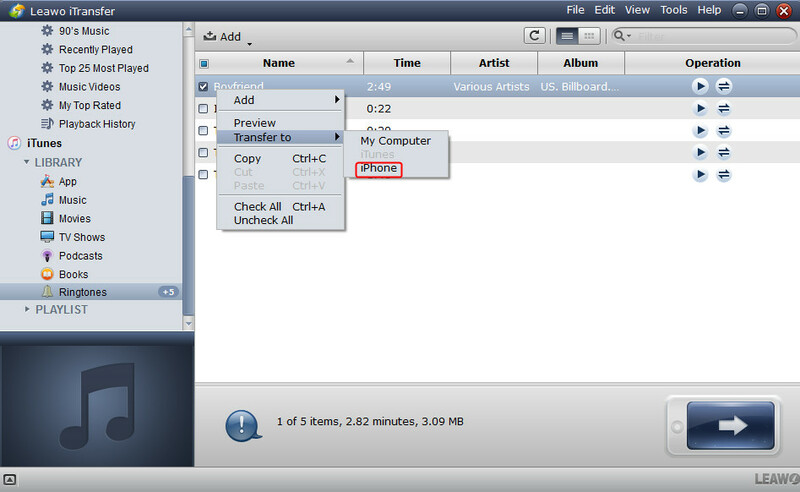 3.After selecting ringtones, Leawo iTransfer will start syncing ringtones from computer to iPhone. The progress bar will notice the percentage of the transfer process. When the transfer is finished, you will get the ringtones in your iPhone. 1.Run Leawo iTransfer and connect iPhone to computer with the USB cable. The software will automatically detect the libraries of your iPhone and display the libraries in the left sidebar. 2.The libraries of iTunes are just below the libraries of iPhone. Choose “Tones” library of iTunes and then the contents will be shown in the right part. Click the transfer button at the right bottom to transfer all the ringtones from iTunes to iPhone; or click the “Ctrl” key and select certain ringtones, then right-click the selected ringtones to “Transfer to > iPhone”. 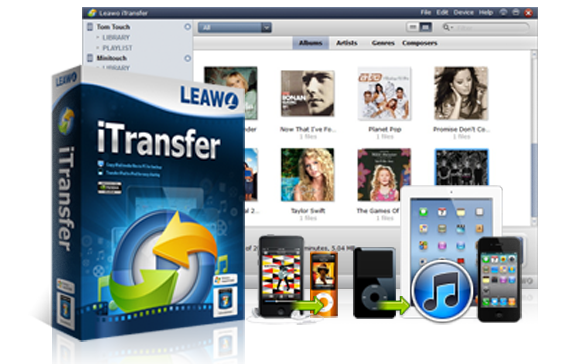 3.After selecting ringtones, Leawo iTransfer will start syncing ringtones from iTunes to iPhone. The progress bar will notice the percentage of the transfer process. When the transfer is finished, you will get the ringtones in your iPhone.